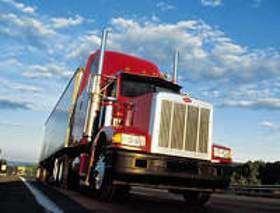 To apply the air brakes during normal stops, push the brake pedal down. Control the pressure so the vehicle comes to a smooth, safe stop. If you have a manual transmission, do not push the clutch in until the engine RPM is down close to idle. When stopped, select a starting gear. With this method, you apply the brakes as hard as you can without locking the wheels. Keep steering wheel movements very small while doing this. If you need to make larger steering adjustments or if the wheels lock, release the brakes. Reapply the brakes as soon as you can. Use only on vehicles without anti-lock systems. As soon as the wheels start rolling, put on the brakes fully again. It can take up to 1 second for the wheels to start rolling after you release the brakes. If you reapply the brakes before the wheels start rolling, the vehicle will not straighten out. 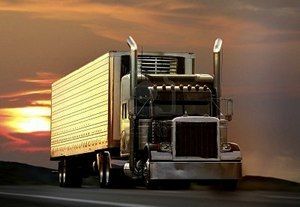 New trucks and truck-trailer vehicles are equipped with anti-lock brakes. The anti-lock braking system is different than the normal air-brake system but works on the same principle. Vehicles that have anti-lock brakes have a yellow light near the driverʼs rear side of the vehicle with the letters ABS stenciled above the light. Once the driver turns on the ignition, a yellow malfunction lamp on the instrument panel will light up, briefly indicating that the vehicle has anti-lock brakes. This lamp will remain constant if there is a malfunction in the anti-lock brake system. For normal or emergency stopping using anti-lock brakes, the driverʼs foot remains on the brake pedal in which the anti-lock module then acts as a foot pumping the air brake system. On the air-brake system the driver must pump or use stab braking in an emergency. If the anti-lock brake system fails or malfunctions, the driver must resort to stopping the vehicle by using the normal air-brake method. If an emergency arises, the driver should use the controlled or stab braking method. The anti-lock brake system should be serviced as soon as possible. The air brake lag distance at 55 mph on dry pavement adds about 32 feet. Therefore, for an average driver traveling 55 mph under good traction and brake conditions, the total stopping distance is more than 300 feet. This is longer than a football field. Make sure you are familiar with the differences between controlled braking and stab braking by reading the below explanations. Questions on the written exam frequently ask about these braking methods. Remember: Only use the stab braking method on vehicles without Anti-Lock Brakes. It's important for you to understand that there is a lag between the time you depress the brake pedal and when the brakes actually engage. For an air brake system, the delay can be 1/2 second or more. It is highly likely that you will be tested on the below formula. Make sure you have the stopping distance formula below memorized. Be sure to memorize the average total stopping distance at 55mph with good brakes and in good traction (more than 300 feet). Be certain you have the stopping distance formula memorized as it will almost definitely show up on your written exam. How can you tell a trailer is equipped with Anti-Lock Brakes? Vehicles that have anti-lock brakes have a yellow light near the driver's rear side of the vehicle with the letters ABS stenciled above the light. Which of the following accurately describes Stab Braking? Stab braking: Use only on vehicles without anti-lock systems. Vehicles that have anti-lock brakes have a yellow light near the driver's rear side of the vehicle with the letters ABS stenciled above the light. Once the driver turns on the ignition, a yellow malfunction lamp on the instrument panel will light up, briefly indicating that the vehicle has anti-lock brakes. This lamp will remain constant if there is a malfunction in the anti-lock brake system. What is the air brake lag distance at 55 mph on dry pavement? Brake lag is something that all air brake vehicles have. It takes about one-half second for the brakes to start working after you've depressed the brake pedal. This is just one more reason why you should maintain a much larger following distance while driving a commercial vehicle. How do you properly use Anti-Lock Brakes? For normal or emergency stopping using anti-lock brakes, the driver's foot remains on the brake pedal in which the anti-lock module then acts as a foot pumping the air brake system. On the air-brake system the driver must pump or use stab braking in an emergency. If the anti-lock brake system fails or malfunctions, the driver must resort to stopping the vehicle by using the normal air-brake method. If an emergency arises, the driver should use the controlled or stab braking method. The anti-lock brake system should be serviced as soon as possible. Brake lag distance isn't only something you'll see in a CDL manual or training course. This is a real issue and one of the biggest downfalls to an air brake system. Should you use stab braking on a vehicle equipped with Anti-Lock Brakes? If the anti-lock brake system fails or malfunctions, the driver must resort to stopping the vehicle by using the normal air-brake method. If an emergency arises, the driver should use the controlled or stab braking method. The anti-lock brake system should be serviced as soon as possible.